These are often undertaken by the amateur, but making them well is much more difficult than it seems to the beginner. If you buy the prepared mouldings so much in use, they will, in most cases, have to be mitred at the corners, which is an operation by no means easy for the beginner, particularly when the moulding is sprung or twisted, as is often the case. Those joints which do not close properly must be trimmed with the plane, for which purpose the mitre shooting-boardis useful, and all four joints should fit accurately before finally putting together, so that none will have to be sprung or twisted in order to close up. At the same time you must guard against winding by sighting across the face, and the angles must be tested with the square. The clamping together is important in such work. 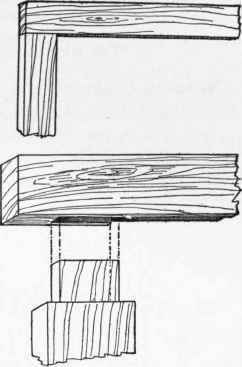 This can be done by laying the frame flat, nailing strips a short distance outside of each of the four corners, and driving in wedges between these strips and the frame until the joints are firmly held (Fig. 333). This can also be done by putting blocks at the corners and passing a doubled cord around, which, by inserting a stick, can be twisted until the frame is held tightly. But making mitred frames of moulding is not suitable work for the beginner and should be deferred until you have had some experience. 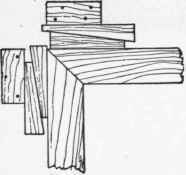 For a plain frame nothing is better than a joint with mortise and tenon (Fig. 334), the rabbet (see Rabbet, this website) at the back being cut through to the ends of the shorter pieces (those having the tenons), but being stopped before reaching the ends of the longer pieces (those having the mortises), as shown. The latter should be got out too long, so as to overlap a little at the ends (Fig. 334). This enables you to take the frame apart more readily when fitting, and with less danger of injury to the work. The projecting ends can be sawed off after the frame has been glued together. The final planing and smoothing of the front surface and the edges should be done after the frame is glued together, careful attention being paid to the direction of the grain. After a frame of this kind is all done, an inner moulding with a row of beads, or some other simple form, can easily be fitted to the rabbet, if desired.